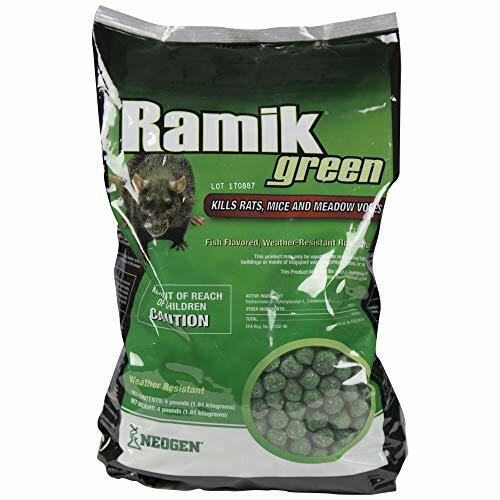 NEOGEN RODENTICIDE Ramik Mouse and Rat Nuggets Pouch, 4-Pound, Green by NEOGEN RODENTICIDE at Halo Grow Box. MPN: 023626006157. Hurry! Limited time offer. Offer valid only while supplies last. One of a kind, ultimate all-weather rodenticide for controlling rats and mice indoors and outdoors. Especially suited for use in wet and damp areas. One of a kind, ultimate all-weather rodenticide for controlling rats and mice indoors and outdoors. Especially suited for use in wet and damp areas. Wax free formula. "One of a kind, ultimate all-weather rodenticide for controlling rats and mice indoors and outdoors." Especially suited for use in wet and damp areas. One of a kind, ultimate all-weather rodenticide for controlling rats and mice indoors and outdoors. If you have any questions about this product by NEOGEN RODENTICIDE, contact us by completing and submitting the form below. If you are looking for a specif part number, please include it with your message.